When I arrived in San Jose last night, the newspaper on the front desk at the hotel had this headline splashed across the front page: “Drones Putting Lives at Risk.” At least five times this year, fire departments trying to battle wildfires in California were unable to fly their helicopters close enough to assist teams on the ground because small drones flown by ordinary citizens were in the airspace capturing footage of the blaze. This morning, at NASA’s UTM Convention, Amazon announced details of a plan designed to solve these kinds of problems. 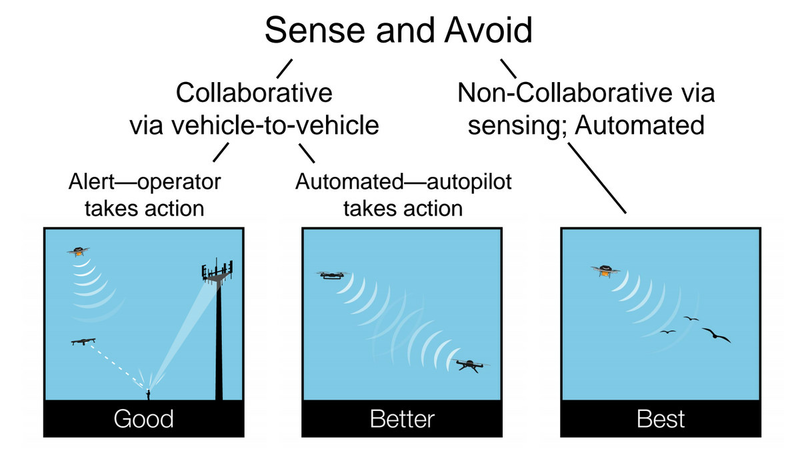 The company laid out its vision for a multi-tiered superhighway in the sky, one in which all drones flying above 200 feet would have the ability to communicate with — and ideally sense and avoid — other aircraft. It’s an attempt to put an end to the Wild West atmosphere that has been the norm for uncrewed aerial systems (UAS) over the last five years, replacing it with a next-generation air traffic control system. It hopes to establish a basic regulatory framework and set of technical standards that manufacturers can work toward. All this would prepare the airspace for a time when thousands, even tens of thousands of drones fly over the average city delivering parcels, monitoring air quality, and handing out parking tickets. Amazon’s proposal, which is in line with similar ideas floated by NASA and Google, would create a slow lane for local traffic below 200 feet and a fast lane for long-distance transport between 200 and 400 feet. 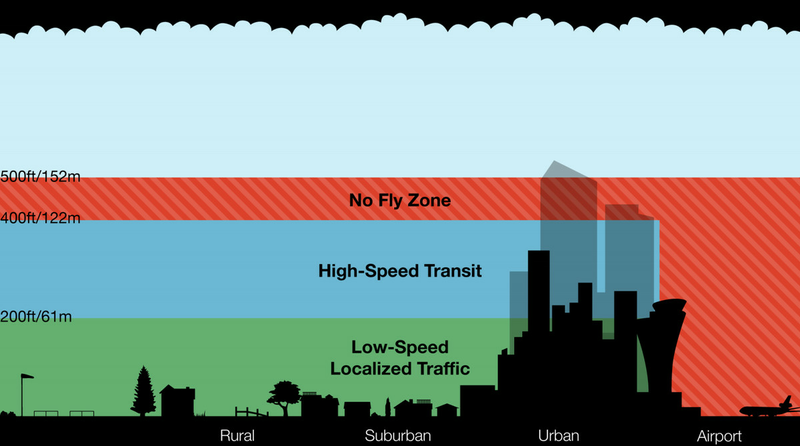 Altitudes between 400 and 500 feet would become a no-fly zone, and anything above that is already against FAA regulations for hobbyists. While some commercial drone operators are pushing to fly large UAS above 500 feet, Amazon is avoiding that discussion for now. If you’re operating a radio-controlled quadcopter with no internet connection, then you would be relegated to the area below 200 feet. That may rub some hobbyists the wrong way, but given that even cheap consumer drones are now connected to the internet through their apps, it seems unlikely that there will be too many UAS which fall into this category. And while complex sense and avoid (SAA) technology is not yet widespread among consumer drones, we are already seeing it appear on units like the Lily, in software from Skydio, and in developer hardware like DJI’s Matrice. If the pace of development in this area continues, sense and avoid technology will be standard on consumer drones within a few years. This new air traffic control system would also link UAS with traditional aircraft. 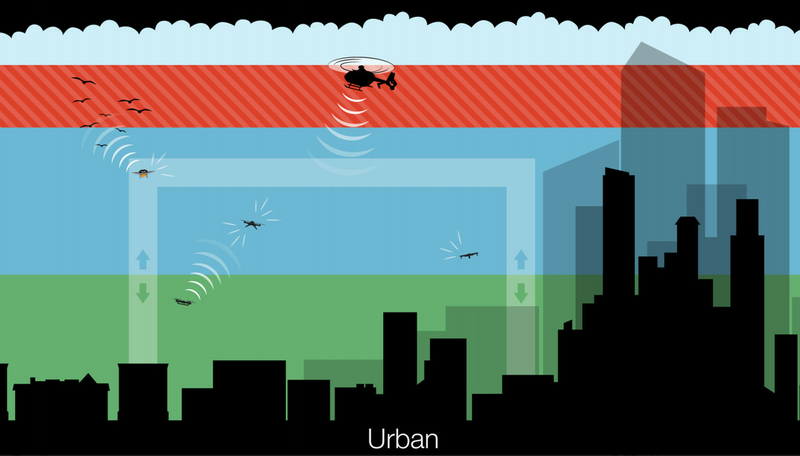 If a helicopter from the fire department needed to fly low over an emergency, for example, it would be able to communicate with command and control, warning drones it was in the area, and creating a geofenced area around itself that would become a no-fly zone, as depicted in the graphic above. Migrants often travel to Europe aboard rickety old fishing vessels which are both unreliable and over loaded. Human traffickers cram them so full that there’s no room left for essential supplies like water or even shelter. Increasingly, voyages are taking place during inclement weather as the traffickers try to avoid their own arrest by Italian authorities. Since 1993, 20,000 people have died in the Mediterranean Sea while fleeing war-torn Africa for the safety of European shores. Now, the world’s first private maritime search and rescue operation is doing everything it can to help them. And they have already saved thousands of lives. 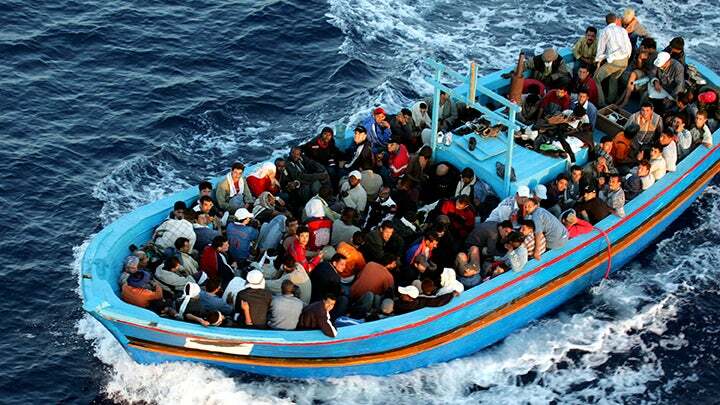 The UN estimates that 207,000 people tried to clandestinely cross the Mediterranean last year. A number that’s accelerating rapidly as conflicts on that continent grow worse. Migrants fleeing Syria and Iraq are adding to their numbers as they travel from the Middle East to Libya before enlisting human traffickers to smuggle them into Europe. On October 3, 2013, a boat carrying over 500 migrants caught fire and sank just a quarter mile from the shore of the Italian island Lambedusa. Over 360 people lost their lives, within view of the shore. It served as a wake up call for European authorities. Christopher Catrambone is an immigrant himself, having moved his family to Malta from his native New Orleans to flee the aftermath of Hurricane Katrina. Last year, he and his wife Regina say they invested“nearly 50 per cent of our savings” — $US7.5 million — to purchase a 130-foot search and rescue ship, two drones and two inflatable boats, then put them to sea complete with a crew of technical and medical experts. “No one deserves to die at sea,” reads the Migrant Offshore Aid Station’s call to action. 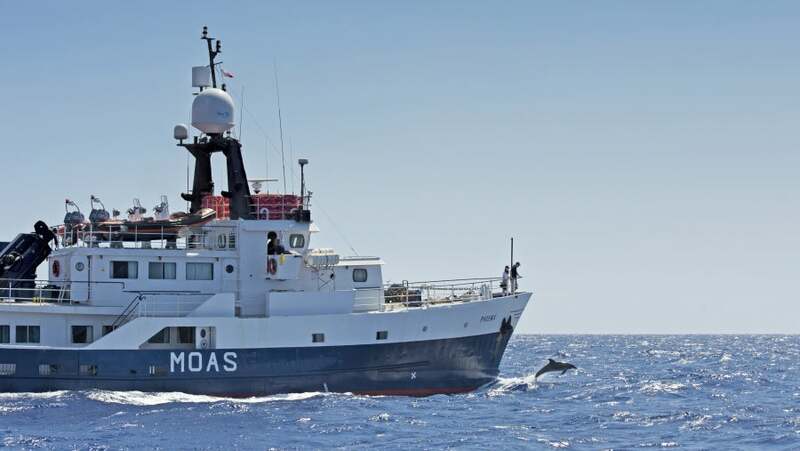 If they find a vessel that may be in need of assistance, MOAS then decides to either respond itself aboard the Phoenix I mothership (above) or call in the Italian Coast Guard if the boat in question is in imminent danger. Those extra eyes in the sky are one of MOAS’s main functions, providing additional search and surveillance capabilities to augment the Coast Guard’s own. Identifying at-risk vessels that may be in need of assistance before their situation becomes critical. The Phoenix I’s main mission is distributing humanitarian aid to refugees in-transit: water, food, medical aid and medical supplies. If it finds itself in a position to pull migrants off a sinking ship, MOAS is prepared to and has bring them onboard the Phoenix, but then defers to Italian authorities to decide where those refugees are taken. MOAS is able to liaise closely with authorities in part because it employs ex-government and military officials to run its operation. Its director Martin Xuereb, for instance, was formerly the Chief of Defence for Malta while the ship’s captain was formerly that country’s Search Mission Coordinator. Catrambone himself is a defence contractor, providing medical services and insurance to companies operating in war zones. “Last year, 3419 men, women and children died while making the dangerous crossing to Europe…mostly by drowning or dehydration,” the organisations says. During its first 60 days at sea alone, MOAS aided about 3000 people. Taking Connectivity to the Next Level @ Internet.org. The Connectivity Lab at Facebook is developing ways to make affordable Internet access possible in communities around the world. The team is exploring a variety of technologies, including high-altitude long-endurance planes, satellites and lasers.